Capital-based Richie Ramsay is chasing Open Championship glory – five years after being in despair in golf’s oldest major. The 34-year-old sits fifth, just four shots off the halfway leader Jordan Spieth in the event’s 146th staging after upstaging many of the world’s best over the opening two days in Southport. 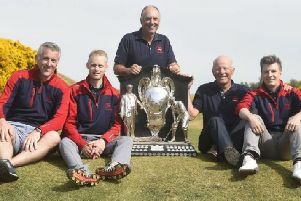 Now he is hoping to stay in the mix as he bids to become the first Scot to get his hands on the Claret Jug since Paul Lawrie in 1999 at Carnoustie. Ramsay’s mood after two rounds at Birkdale was a stark contrast to how he felt at the same stage after missing the cut just up the Lancashire coast at Royal Lytham in 2013. That disappointment came hot on the heels of a similar early exit from the Scottish Open at Castle Stuart the previous weekend. “This is the lowest point of my professional life,” he groaned at the time. “The Scottish Open and The Open are the two biggest weeks of the year and they’ve easily been my worst. “I’m going to have to sit down and work out exactly what I’m doing because it’s not even close to satisfactory. “I’m going to have to come back somehow and I’ll just sit down and figure it out. It’s not a time for knee-jerk reactions, but there’s going to be some serious changes. The three-time European Tour winner smiled as he was reminded about that particular interview after signing for 13 straight pars before getting back a dropped shot at the 13th in his second round by rolling in a 15-foot birdie putt at the par-5 17th. “That was a long drive. I remember that!” he admitted. “I drove from Lytham back to Edinburgh in four hours, with a mixture of being upset and frustrated. But I’ve ticked one of the boxes now, to mix it with the top guys in the world over two days in a major. It’s something I’m proud of. I’ve worked hard and it’s taken years. Part of the reason Ramsay now finds himself in contention in the game’s oldest major is that he is no longer obsessed with golf since first getting married and, more recently, the arrival of his daughter, Olivia, who is aged one. As recently as the Scottish Open last weekend, she soon helped him get over a disappointing final round as he ended up in a tie for 35th behind Spaniard Rafa Cabrera Bello at Dundonald Links. “It has calmed me down a bit. I definitely don’t take things for granted as much,” said Ramsay of fatherhood. “I’m a little bit more patient. Olivia teaches me that. I think it settles you down as a person. It takes your mind off golf. “I was very one-dimensional when I was young. If golf wasn’t going well, life wasn’t going well. Now, when I come around the corner, she’s there. Last Sunday, I had a bad finish. I walked into the players’ lounge and Olivia clocked me from about 20 yards. The only other Scot to make the cut was David Drysdale. Two-time major winner Spieth, meanwhile, backed up an opening 65 with a 69 to hold a two-shot lead over compatriot Matt Kuchar. The Texan chipped in for a par at the 10th before holing from 35 feet for an eagle at the 15th to move to seven-under before giving a shot back at the next. “My patience was a bit thin around the turn and that chip-in was massive,” he added. World No. 4 Rory McIlroy sits five shots off the lead after he backed up Thursday’s battling 71 with a 68.